I’m a solo traveller... will I meet other solo travellers? Absolutely! The majority of our passengers are travelling solo. Kiwi Experience is a social experience guaranteed to leave with new friends from across the globe. I’m travelling with my partner / best friend – can we book our buses, activities and accommodation together? Yes. If you are booking and travelling together, we can book you on the same bus with the same dates, not a biggie! Do we have to stay in the accommodation you recommend or can we stay elsewhere? We give you the freedom and flexibility to choose any accommodation style you like. Though we select the best value for money option in each stopover (and we do recommend staying with the group), if you’d like to stay somewhere else that’s absolutely no problem at all. This is your experience. Can I start anywhere on the hop-on-hop-off network? The majority of our passengers start their trip in Auckland (this is where our main airport is), however, our unlimited national travel passes allow you to start and finish anywhere you like on our travel network. I loved <insert your fave location in NZ>, can I go back and visit again? Sure! With our unlimited national travel passes, you can absolutely revisit a destination on our travel network. Most passengers with longer itineraries travel through some of the major hubs a few times each year, allowing them to become more of a local. Am I too old/young for Kiwi Experience? We welcome the young, and the young at heart aboard our buses, there is no upper limit! There is however a lower limit; you’ll need to be 18 at the time of travel. 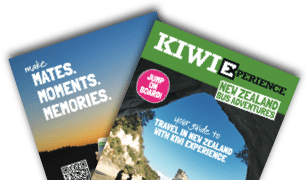 Can you help me book my trip across New Zealand? I totes need help. We’d love to! Just get in touch with our team via phone/ email/ social and we will happily help you plan your trip with us. While not mandatory, travel insurance is recommended and should be taken out when purchasing a pass. As well as making sure your expensive stuff is covered, you should also get comprehensive travel insurance (covering you for all medical expenses incurred while travelling). How much should I budget for each day? We recommend you budget between $50 - $100 per day to cover food and super fun times. From time to time, it may be worth putting a little more aside to pay for the really crazy stuff like skydiving. How much can I travel? If you have an unlimited national travel pass you can hop-on and hop-off the bus on our travel network as many times as you’d like over 12 months. Revisit your favourite spots on the circuit once you have done the whole pass loop at least once. If you have a standard national travel pass you can hop-on and hop-off the bus for as many days you have allocated from your pass.